Hayo’u offers four daily self-treatments using techniques & tools that are most effective in protecting the body from stress: Gua Sha self-massage, Qi Gong & conscious cleansing. With regular use you can expect your skin to have a more natural glow, your body to be more fine-tuned & your sleeping patterns having a more positive dynamic with how you feel upon waking up in the morning. You can do each ritual separately or slot them together. I will share my way of using them below, based on Katie’s personal assessment during my consultaion, but you should try doing each one of them, observe how they make you feel & decide when is the best time to integrate them into YOUR day or evening. The Beauty Restorer is a facial massage tool, using which makes me feel like my own facialist in the privacy of my own bathroom. Made from Xiuyan Jade, cool on the eyes, cool on the skin, it is ergonomically shaped to glide easily along the contours of your face & neck. Coupled with a simple Chinese self-care technique called Gua Sha on your face, it increases the circulation & brings more oxygen to your skin (particularly good for those of us, who are over 30). Using this tool & technique daily, which makes you skin look temporarily flushed, it helps stimulate collagen production & thus makes wrinkles appear less noticeable. The technique also stimulates your lymphatic system & helps drain extra fluid, clear away congestion more effectively, as well as speed up the process of toxins illumination. With regular use your skin will not only look more glowy, but will appear plumper, more even and with your natural bone structure better accentuated. This tool, which is perfect for the face and neck, but ‘too soft’ for the body, also helps rectify skin’s responses and helps nourish the skin from the inside out. It also draws out the tension from your face, which make your face look more gaunt & intense. By activating acupressure points, it will also drain the tension out of your features, making you feel more relaxed as a consequence. 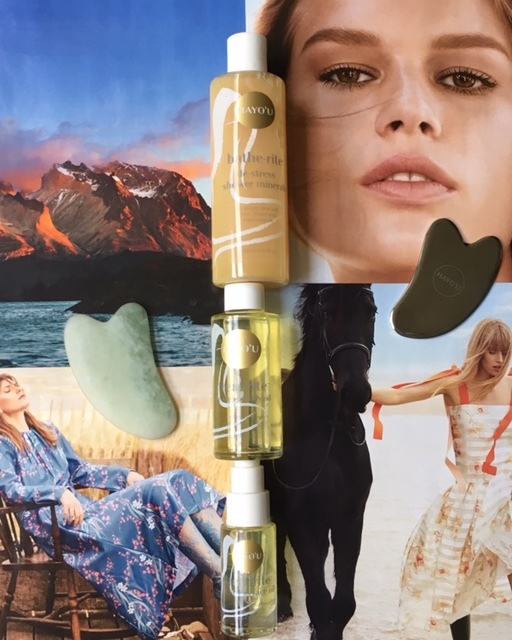 Gua Sha is designed to work with oils, so while you can use it with your favourite face oil, that works for your skin type, Katie also developed her own face oil that acts as a perfect partner for the Beauty Restorer. A concentrated beauty treatment oil, it contains Camellia & Palmarosa, which help to nourish the skin, while stimulating cell regeneration. The oil comes in a glass bottle, with a pipette, making for easy & practical dispensing process. Unscrew the bottle, press on the button on top of the pipette, dispense a few drops of the oil on your hands, warm it up for a few seconds, inhaling the heady scent, which becomes subtler within minutes and makes you feel like you are enveloped in a sensuous & comforting cocoon. Then massage it all over your face & follow up with the Clear, Sweep & Press technique, that is clearly explained in the brochure that accompanies the oil. I was lucky to have Katie demonstrate the Gua Sha facial technique in person, but I also watched Katie’s video & practised a few times, in order to become confidently familiar with the technique. Remember, practise makes perfect. You will also become more familiar with your own face & will hopefully become better equipped in deciding upon your daily skincare needs. A freckle, a wrinkle, a spot, some pigmentation – examine your face regularly & adjust your skincare accordingly. You & your skin will become happier with each other, no matter your age or skin type. Katie recommends doing this ritual after bathing & in that case you don’t have to warm up the oil in the palm of your hand – just apply it directly to your skin & flow. The best way to handle stress is to clear it every day. Removing stress regularly means it can’t build, making you ill in the process. The Body Restorer is a pretty impressive tool for drawing stress out of the body, using Gua Sha. Using this tool & ritual you will override the stress response by engaging physically, together with your conscious mind, of shoeing it out and away. Hayou’u is almost like a call to action in order to master your health – ‘hey you, be here now. Be present. Be You! I was lucky to observe Katie & have her teach me all the rituals & this one, when done correctly, will wake you right up! It will also make your skin look red in places for a short period of time – don’t worry, that’s how it should be! I do recommend watching Katie’s tutorials a couple of times to start with and repeating the movements alongside her, so you do them correctly. I do this ritual with particular vigour on my abs & done regularly it actually helps to shift fatty deposits, if you have them, combined with a sensible diet & regular exercise. More effective than fat freezing, might I add, based on personal experience! It’s not the most delicate ritual, but somehow doing it makes you feel powerful and in control of your body. It also gets you in touch with your body, as you will become more attuned to the signals it sends you before a small niggle might turn into a bigger issue. It truly is a tool like no other that I now use regularly and with great pleasure. As I said earlier, you can use the body restorer tool with your favourite body oil, but Katie also developed one as part of the Hayo’u Method range. It is a concentrated massage oil, which was formulated with the vibrantly orange Sea Buckthorn berry & infused with Lotus Flower, Lemongrass & Frankincense, which will lift your spirit, while calming your shen. While this oil isn’t organic, it doesn’t contain paragons, SLS, SLES, petrolatum or mineral oil. Warm some of the pale yellow de-stress body oil in the palm of your hand and then massage it into your body, using deliberate strokes and paying attention to areas that feel sore, tense or painful. In order to engage body’s own micro-circulation, use a firm pressure & sweep the Body restorer across the body above your chest area, on your upper arms & shoulders, as well as the back. As I said earlier, I also use it on my abdominal area. Both the body restorer & the massage oil have accompanying booklets, which will guide you in your movements ( Katie recommends repeating each stroke eight times, but if it feels too much to start with, do as many as you are comfortable with & then build up up to eight). If I have a small criticism, it relates to the packaging of the body oil. I like the glass bottle, in which it comes, but it’s wide neck allows the oil to escape into the palm of my hand a little too generously – I would have preferred a pipette, like with the facial oil, or a stopper at the top with a hole, so you can control the flow of the oil a little more. But as soon as I smell the scent of this oil, my mind becomes more sedate & criticism doesn’t roll as easily off the tongue. You can do the treatment ritual daily, but doing it two to three times a week has its benefits too. In essence, it is the commitment to the practise and paying attention to how this or that ritual makes you feel & taking mental notes, as this or that ritual becomes part of your daily wellbeing ritual or ‘me-time’. Take the time to take deeper breaths, both inhales, as well as exhales, and try to decipher the oil’s notes, as it starts developing on your skin, aided by the increased circulation from the massage with Body Restorer. Yin & Yang at the tips of your fingers. Deep abdominal breathing is the most immediate defence against stress. Chinese medicine takes this to a whole new level & teaches you how the ‘smile’ deep in the energetic centre of the body is drawn out by a rescue breath. In just one-minute, the Rescue Breath Ritual disperses the negative emotional impact of stress & can create a deeply restorative meditative state. This is one ritual that initially made me raise my eye-brows when Katie demonstrated it. While I could understand the theory behind it, it came across as a little hippy. Then I started practising it – the hard exhale in the morning, after brushing my teeth & the smile breath anywhere I feel like doing it during the day – while writing at my desk, on the tube or while driving. When my kids saw me doing the trio of hard exhales in front of my bathroom mirror, getting rid of the carbon dioxide accumulated in my system, they collapsed giggling and said that I looked like a combination of hissing snake & roaring lioness. I, in turn, explained to them that conscious breathing helps to transform the anger or negativity one might might feel, decrease the heart rate & increase oxygen intake – all this by simple engagement with your parasimptomatic nervous response & getting rid of the bad by taking in the good. When someone is stressed, blood flow is diverted from the gut & skin to the skeletal muscles, in preparation for “fight or flight”. This automatic reaction disrupts the flow of circulation around the body making one feel first anxious & then tired & lethargic. Based on the healing benefits of Qi Gong, a Chinese martial art, the Reset Ritual invigorates circulation, releases stored tension, loosens the spine and stimulates your digestive function & kidneys. I often do this ritual in the late morning, but it fits equally well into the afternoon, when you feel a bit tired or need a natural boost, before doing say a school run or having another round of meetings. First, you simply shake for fifteen seconds – imagine yourself dancing to your heart’s content, like there is no tomorrow? Well, shake in the same way. Then make two fists and drum your chest, then outside of your arms, then inside, switching to abs (quite effective for helping shift some stubborn fat deposits), outside & inside of your legs & then switching to the back, paying particular attention to the area where kidneys are located. Once you did all that, take a moment to see how you feel. Then, just twist for a minute of two – for more detailed description just watch Katie’s video & you are ready to go. Sometimes I would even do a shorter version of it, with focus on my chest, as I sit at my desk & find myself procrastinating, instead of writing or editing. Simple, effective & naturally energising, it acts as a tonic for your body, without a trip to the gym or a walk outside. If you chose to walk outside shortly after it, the effect can be in enhanced, at least that’s how I feel, when I need to sprint between various meetings. Wherever possible, use your daily shower or bath as a chance to extend the Rescue Breath Ritual & deepen the benefit for your body, a two-in-one of sorts. The de-Stress Bath & Shower Minerals contain a concentrated formula of Himalayan pink salt, magnesium and maris sal to help draw out deeply held tension. Relaxing the muscles immediately engages the parasympathetic nervous system, which switches our bodies and brains into a ‘rest’ phase. Looking like caramel encased in a bottle, Shower Minerals can be rubbed all over your body in the shower or dispersed on the sponge or glove that you use – ultimately it is about your own preference. Take deeper inhales to enhance the efficacy of the product and enjoy the sensual pleasure of this product on your skin, with the warmth of the water magnifying it. As you shower, take five deep abdominal breaths and see if integrating a Smiling Ritual feels natural. Sometimes I just shower, at others I do smiling breaths – there is no rigidity to the method, it really is about doing it in such a way it makes YOU feel good. As the weather is starting to turn, some of us will become more eager to have baths, especially as autumn will give way to the cold & dark winter. During my consultation with Katie, I did something that is very unlike me – I ended up putting my nose into her De-Stress Bath Minerals and kept on doing it, as our conversation flowed. There is something mesmerising in the way HM bath minerals smell & I can’t still figure exactly what draws me to them more – its smell or the calmness that they impart, as I consciously slow down my breath, focussing on deeper exhales. It is a given that a product needs to deliver what it promises on its packaging – there are more & more brands that make unrealistic or controversial claims – so what I like about the Hayo’u Method is that the products have simple names & don’t make any unsubstantiated claims. All the more the reason for consumers to have a look at the packaging, smell the products, as it is an important part of whether you will enjoy using the product or not, plus read the list of ingredients, before deciding, if the product will benefit them. There are lots of fancy gadgets being launched, many of them quite expensive, yet after purchasing them, many end up being redundant within weeks, if not days of use. I don’t know if ‘mindfulness’ is the correct term to use when it comes to shopping, but I urge you to start paying attention to why you purchase this or that thing & if you get extended joy from using them, beyond the initial excitement of the purchase. But back to the pleasure of mindful beauty. You need to dissolve two handfuls of minerals into warm water & immerse yourself in it for at least 20 minutes. The comfort of the warm water, bath minerals helping remineralise your body and the bliss of peacefulness, when it is just you & your thoughts. Having just come back from a wonderful summer holiday, only a week into a new school year, I already feel like the holiday is a distant memory. So I am particularly looking forward to a dark, cold night, when I can sink my frayed nerves & hectic body into the bath, a good book or magazine article in hand & let the water, infused with the minerals take the troubles away, with my conscious participation. Until then I stick to showering & using the time to not just cleanse my skin & hair, but to get rid of the deeper layers of stress & negativity accumulated daily. One last thought I want to leave you with, hopefully to reflect upon. We live in the society which is intent on increased consumption & increased self-doubt, yet when you go away on a holiday you come back with renewed realisation how little you actually need to look & feel good. Hayo’u method is exactly about that – little steps that make a YOU look & feel better, all you need to do is just show up daily at the alter of worshipping your own wellbeing. An investment in yourself that isn’t pricey but is timely. One that will positively impact your wellbeing.